From Divan E - Shams 1996. Lithography with foil stamping by Betye Saar. 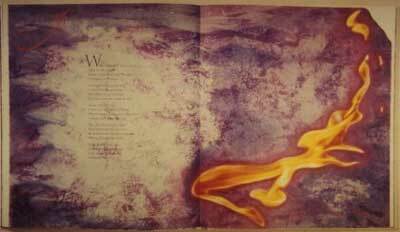 Saar photographed flames until this one appeared and became the artist's expression of Rumi's poem "Fire." Thirty-eight hand-crafted books that constitute the full collection of Vincent FitzGerald and Company are on display through July 7, 2000 in an exhibition entitled "Themes & Variations: The Publications of Vincent FitzGerald & Company," at Columbia University's Rare Book and Manuscript Library. Counted among the collections of the Whitney, the Metropolitan Museum of Art, the Victoria and Albert Museum in London and the Bibliotheque Nationale in Paris, these distinctive, hand-bound books of all dimensions are printed on the finest handmade papers and contain the illustrated words of literary masters seen through the creative eye of contemporary visual artists. The Kempner Gallery of the Rare Book and Manuscript Library is located on the 6th floor Butler Library, 116th and Broadway. The exhibition is free and open to the public. Hours of operation are: Monday, noon - 7:45 p.m., Tuesday - Friday, 9 a.m. to 4:45 p.m. Beginning May 8, Monday hours are 9 a.m. to 4:45 p.m. Call 854-5153 to confirm. The complete run of exhibited editions represents over twenty years of collaboration between a growing repertory company of visual artists, writers, poets, translators, calligraphers, typesetters and other artisans who maintain the traditional skills of paper making, book binding and type-setting. The Manhattan-based press is led by Vincent FitzGerald, a Columbia alumnus, who orchestrates the conception, design and production of each limited-edition book. FitzGerald has brought together the work of such authors as Jalaluddin Mohammad Rumi, James Joyce, Franz Kafka, Edith Sitwell, Lee Breuer, and David Mamet, with artists such as Susan Weil, Judith Turner, Edward Koren, Neil Welliver, Dorthea Rockburn and James Nares. Other members of the company include artisans such as book designer and calligrapher Jerry Kelly, paper artist Paul Wong of Dieu Donné Papermill, and printer Daniel Keleher of Wild Carrot Press, in addition to Zahra Partovi, book binder and translator. 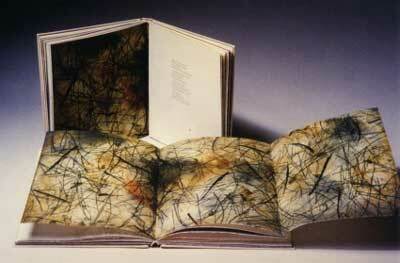 While some books are dedicated to one visual artist's interpretation of a particular text, such as David Rattray's poem To the Blue Wall (1993), whose coptic binding allows the book to open as a circle showing a rainbow of colorful pages pages illuminated by the etchings of artist T. Kurahara, others include a diverse body of images created by different artists responding to a particular text. Rumi's Divan E Shams reveals distinct images created by 15 artists, each capturing the sentiments of separate poems in the collection. Highlights include Brideship and Gulls by James Joyce (1991), Divan E Shams, poems by Rumi (1996) and Parables and Pieces by Franz Kafka (1990). As theater critic, translator and Columbia alumnus Michael Feingold, a member of the company, has written: "In our degraded age of uncaring mass manufacture...one artist (FitzGerald) was able to find so many kindred souls to share his love for works that are beautiful, meaningful, individual and scrupulously made." From Divan E - Shams 1996. Etching by Sandy Gellis. Gellis illustrated a Rumi poem with this image that was inspired by the flow and reflections of a river. FitzGerald began his company years ago to bring artists and writers together, facilitating collaboration in an age where isolation was defining art. By breaking away from the competitive climate fueled by art-as-big-business, FitzGerald and his company seek to resurrect the spirit of Paris in the twenties, when writers, artists and musicians worked together to produce ballets, operas, even books. Each book involves the collaboration of a minimum of 15 people working together on one project, sometimes over a period of years. Virtually every known method of creating visual art is represented in these books. In the case of some, modern techniques, such as computer-generated images, are used in combination with etching and engraving. A series of events will be held at Columbia during the course of the exhibition. On April 12, the Library will sponsor a reading of the works of Rumi by Columbia alumnus Zahra Partovi, in her translation in Persian and English; Matthew McClanahan in English; and Homa Partovi in Persian. Other events (dates to be announced) include a staged reading by members of the Atlantic Theater Company, directed by Michael Feingold, of David Mamet's The Frog Prince and Harry Kondoleon's The Côte d'Azur Triangle; a performance of Robert Schumann's A Woman's Love and Life by Joan Morris and William Bolcom; and readings of the works of Gertrude Stein and James Joyce. href=" http://www.columbia.edu/cu/libraries/indiv/rare/lectures.html" Click here for updated information on related events. A catalog has been published by Columbia University and Vincent FitzGerald & Company to accompany the exhibit, with essays including "Theater, Music and Translation" by Michael Feingold; "A Poet's Voice" the work of Mohammad Rumi by Zahara Partovi; "Creating Connections" by Judith Turner; "Drawn to the Music of James Joyce" by Susan Weil; "Views of David" the work of David Rattray by Eileen Myles; "Alternatives to the Traditional Illustrated Book" by Donna Stein; and Gertrude Stein's Tender Buttons, etchings by Susan Weil. Catalogs are available at the Rare Book Manuscript Library. Thanks to the generosity of Sylvia and Joseph Radov, the exhibited books are part of the Book Arts Collections of Columbia's Rare Book and Manuscript Library. The Library's Book Arts Collection began in 1930 under the leadership of Hellmut Lehmann-Haupt, the first rare books curator. Today, the Book Arts Collection, rich in the tools of the graphic arts as well as commercial and fine press printed books, is considered one of the best collections of its kind in the world.